You can select your preferred golf holiday from our list of best offers or customise your request by using our search boxes below. The fantastic 18-hole Bonalba Golf Course on its doorstep, Hotel Bonalba Alicante is a delightful four-star hotel in Alicante offering an unforgettable golf holiday experience. Book your room at an affordable price. The fantastic 18-hole Bonalba Golf Course offers an unforgettable golf holiday experience. Just 10 minutes to the centre of Alicante and 25 minutes to Alicante Airport, Hotel Bonalba just located in a privileged position. 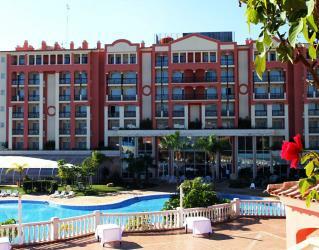 The hotel offers various facilities, modern rooms, swimming pools and an outstanding golf course. 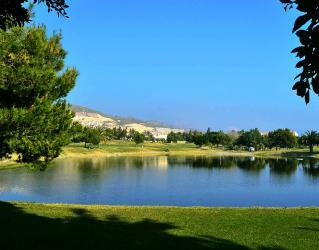 Surrounded by gardens and the golf course, you will enjoy the feeling of peace throughout your holiday. Your first golf break at Bonalba will not be the last. 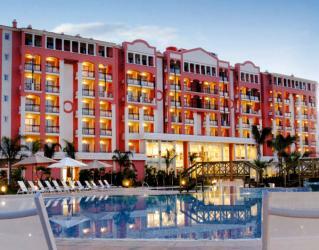 The accommodation options of the hotel are rooms and suites in several types. There are theme rooms in the hotel, offered with extra charge, enabling you to wander the world freely in the comfort of your room. The types of theme rooms are African room, Buddha room, Ethnic room, Ipanema room and English Garden room. All of the hotel rooms are spacious and decorated in a modern way. They are all equipped with air conditioning, LCD TV, telephone, internet access, minibar, hairdryer and a complete set of amenities in the bathroom. All are equipped with Aloe Vera mattresses; adding more comfort to your stay. If you're looking for a hotel with golf courses for your holiday, Sercotel Hotel Bonalba Alicante is just an excellent choice for you. 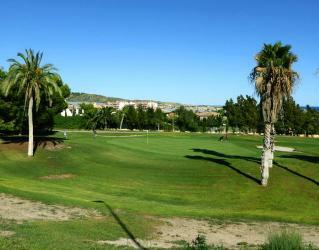 The hotel is strategically situated only 200 yards from the 1st tee of the Bonalba Golf Course. They offer tailor-made services for golf lovers. Set in an elegant and relaxed ambience, Amapola Buffet Restaurant is in service with the most delicious typical dishes of the region. 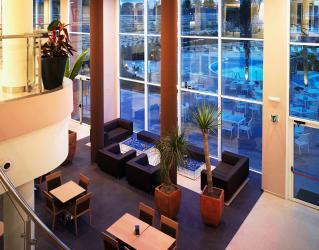 The A’la Carte restaurant of the hotel, Restaurant Cervantes is offering local wines and food from the Costa Blanca. Filled with natural light and featuring the views of the pool and the gardens, the restaurant is a perfect setting for romantic dinners and tastings of local wine and food. Café Lounge serves different types of coffees, teas, cocktails and drinks in a cosy atmosphere. Offering a wide selection of beers and spirits, Irish Pub Bud Rose is a great spot to gather after a long day of golf and discuss the day with a drink. After 10:30 pm, live concerts, jazz concerts, magic performances and showmen take the stage here. *Please note that the availability of restaurants may change seasonally and extra charges may apply. The wellness centre of the hotel offers moments of peace and total relaxation in a tranquil atmosphere. The water and balneotherapy area is the right choice for unwinding. Here you can find a heated indoor pool with different kind of water jets, Turkish Bath, sauna, mud therapies and beauty and body treatments, body wraps, hairdressing and various types of messages by the highly qualified staff. Designed by Ramon Espinosa in 1995, Bonalba is regarded as one of Costa Blanca's most demanding courses and is definitely worth paying a visit. Water comes into play on nearly half the holes, especially in the first few holes as you are still warming up. It is quite undulating too in places. The Bonalba Golf complex is quite a challenge for golf lovers, due to its strategically located bunkers. Thanks to its typically Mediterranean vegetation, the natural enviroment of the Bonalba golf course is the ideal place for golf lovers of all levels. The Alenda Golf course was designed and built by Roland Favrat with the maximum respect for the original lay of the land and the estate’s natural vegetation, avoiding any aggressive movements of earth during the construction process. The golf course was completed in October 1999. It covers 49 hectares of land, 18 holes, par 72 and 6,257 metres in length, as well as an excellent practice area. At the restaurant’s helm is a team with extensive professional experience in the hotel and catering industry. The menu offers the highest quality produce, only the very best of the Mediterranean diet, and a carefully selected list of wines and cavas. Do not miss the cafeteria area on the peaceful terrace, just sit back and take in the breathtaking views over the golf course and the surrounding hills. The ideal spot to take a break with a welcome drink. * Please note that these photographs provided by the hotel represent certain rooms. The room that you reserve may differ to those shown above.